View topic - kde 4.7 :: aptosid.com :: aptosid - Debian hot and spicy! let's hope in a Christmas’s gift! 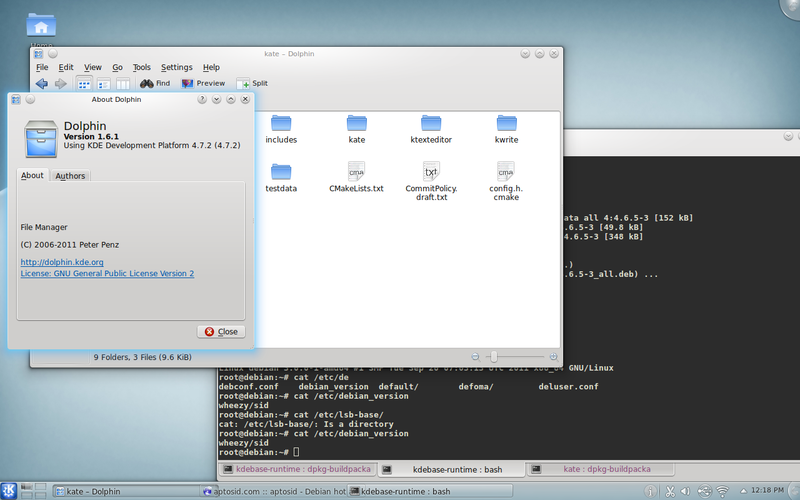 anyway, usually no new version came out before qt-kde repo is used. Till now this did not happen.. it is not a good signal. It would be nice if devs write just a blog post or two to say "Hey, we're working on it!" or "we have problem splitting packages and building the dependencies". Maybe someone could be more interested in supporting them, or even joining the team. I think they're too much isolated, isn't this the era of communication? I would be happy too if there would be a bit more information in general. for me it is not that easy to understand what does this mean. Anyway someone else could find it interesting. Given that they started working on 4.7 between 13 and 5 days ago...we're at the beginning, in my opinion. ..in January if i'm right. I like quality. I'd like communication too. Default desktop looks nice and I see you got 4.7.2 now. How well does it run? it is not a huge change. But it ran well on my laptop. I have no intention of installing Chakra. Aptosid continues to be my distro of choice. šumski: instead of building your own, you should get involved with the debian-qt-kde team and bring 4.7 to all debian users. However I would also suggest you cooperate with other devs. That would be awesome. To compile all of KDE including ancillary apps would take days and be a real PITA. Components that take the longest time to compile are kdelibs, kde-workspace and kdepim. I already did a backport of 4.6 for squeeze - qt takes a REALLY long time to compile. Marble won't build - it complains something about qtlocation's cmake, so i probably won't build it. Are you using kdesrc-build zu compile KDE? I do not manage to compile KDE now for some months because of some strange dependencies. * glib2 - Low-level core library for data structure handling, portability wrappers, etc. View OpenGL ES2.0 details in kinfocenter. View FireWire devices in kinfocenter. This is strange somehow. Do you have an idea how to fix this or where to get some more information?